I love birthdays and I especially love gift giving. There’s something about picking out a present for someone and watching the joy in their face as they unwrap it. It can however get really stressful, particularly when you realise that you don’t actually know them all that well. Since working at my current job I’ve met some lovely people and despite being a lone worker on most days I’ve grown very close to some of my colleagues. We can talk and have a laugh and it’s all good until birthdays come around. Every time a birthday nears I go into panic mode. What is an appropriate gift to buy? Are we just colleagues? Friends? Is there an appropriate budget? Do I risk buying online and not getting a gift receipt? So. Many. Questions. After my little melt down this month in the run up to a colleague’s birthday (Happy Birthday again Jo!) I’ve decided to do a little list (gotta love a list) of all the things that are fool proof for buying a colleague. 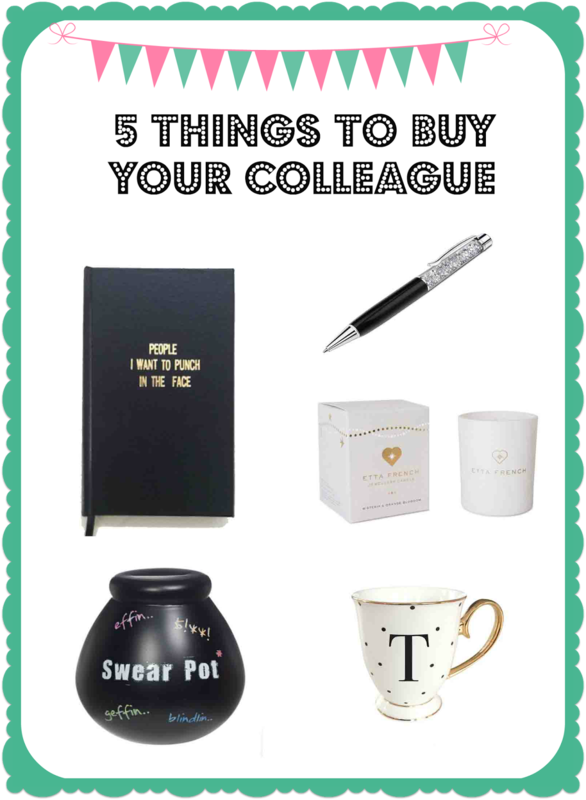 These have been narrowed down and I’m now bringing you my absolute fave gifts to buy a colleague. 1. Swarovski Pen – This gift is just beautiful. I went into Swarovski recently and saw that they’ve upgraded their selection and have even prettier pens to choose from now, including a rose gold one! At only £24, you can’t go wrong. It’s a perfectly acceptable amount to spend especially for such an amazing gift. Besides, no one will be able to steal that pen without getting caught! Perfect for: Men and Woman, office workers and the one who never has a pen on them! 2. Mug – Whether it’s personalised or got a funny quote on it, let’s face it you can’t actually go wrong with a mug. My favourite mug at the moment is the Bombay Duck initial letter mugs. It took me so long to be able to get hold of the letter R but now it’s one of my prized possessions. Nobody in the office can nick my mug without feeling super guilty that it’s not theirs! Perfect for: The caffeine addict, the pernickety one who stresses about sharing mugs. 3. Notebook/Planner – I’m not sure I know anyone who doesn’t like stationary. There are countless companies that I could list but there’s nothing better than getting one personalised to suit your colleagues personality. If I were to get one for myself, I’d probably have “List of people I’d like to punch in the face” written on it. Perfect for: list makers, forgetful people, people who like to look busy but are instead doodling your boss falling off a cliff. 4. Swear fund or money box – I love the pot of dreams money boxes where you can’t actually get to the money unless you smash it open. If you know your colleague well enough then you can turn these into a swear box and treat yourselves to a night out once it gets filled. Perfect for: The foul mouthed one in the office or the one who is always broke. Perfect for: People you actually like in the office. What are your favourite gifts to give to colleagues?